Check out some of the biggest news stories of the last year as seen through the lenses of some of Australia's best press photographers. The exhibition showcases winners from the 2018 Nikon-Walkley Press Photography Awards. Around since 1956, the Walkley Awards are the highest honour in Australian journalism, and celebrate excellence across all media. © Matthew Abbott, Oculi. Rain On My Parade. 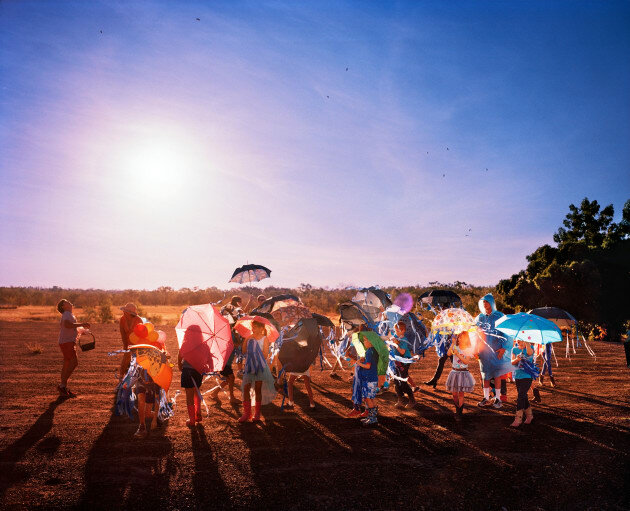 At the annual Poddy Dodgers Festival in the Queensland town of Croydon, people gathered to walk the main street with umbrellas, raincoats and homemade raindrops. The Nikon-Walkley Awards for Excellence in Photojournalism recognise the work of photographers across a range of genres, from news and sport to portraiture and photographic essays. From the other side of the world to our own backyard, this exhibition lets viewers reflect on the year in news, through the individual worldviews and skilled lenses of Australia’s best photojournalists. Image © Jenny Evans, from her series, Life Saver, for Getty Images and the Daily Telegraph. Winner of the 2018 Walkley for News Photography.